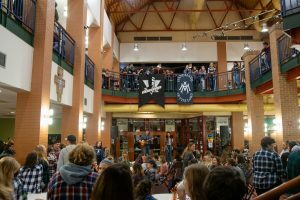 On the evening of Saturday, Sept. 29, the J.C. Williams Center was packed full of hundreds of students wearing flannels for the annual Flannel Fest put on by the Handmaids of the Lord and Soldiers Under Command households. The J.C. was filled with the warm, spicy scent of fall, the sight of plaid flannels and the sound of live music and conversation. Outside, a bonfire warmed up the crisp, late September air, with the scents of the fire and the nearby food truck intermingling. Households Handmaids of the Lord and Soldiers Under Command collaborated to put on this event. 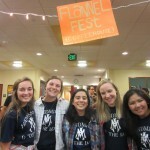 “This is the only fundraiser for both household,” said junior Rebecca Turner, the Handmaids’ coordinator for Flannel Fest. She said that this event is unique to the two households because it is not a typical weekend dance. The event is also special for Soldiers Under Command, who see it as a chance to celebrate the feast day of their patron, Saint Michael the Archangel. Inside the J.C., students filled every space available – from the railings upstairs to the niches by the Gentile Gallery – to mingle with their friends and listen to the live music. “The music is very entertaining. The food is delicious,” said junior Kira Steinbrecher. 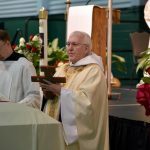 According to Turner, the two hosting households specifically encourage Franciscan University students to sign up in order to share their talents with campus. The entertainment consisted of singers with guitars, a keyboard and even some drums. On the far side of the lower J.C., there was a table full of baked goods, including an entire section of gluten-free food. Next to the baked goods, another table sported apple cider, coffee and hot chocolate for students to enjoy. Outside, students ventured to try out food from the food truck, which was under a red umbrella lit with LED lights. 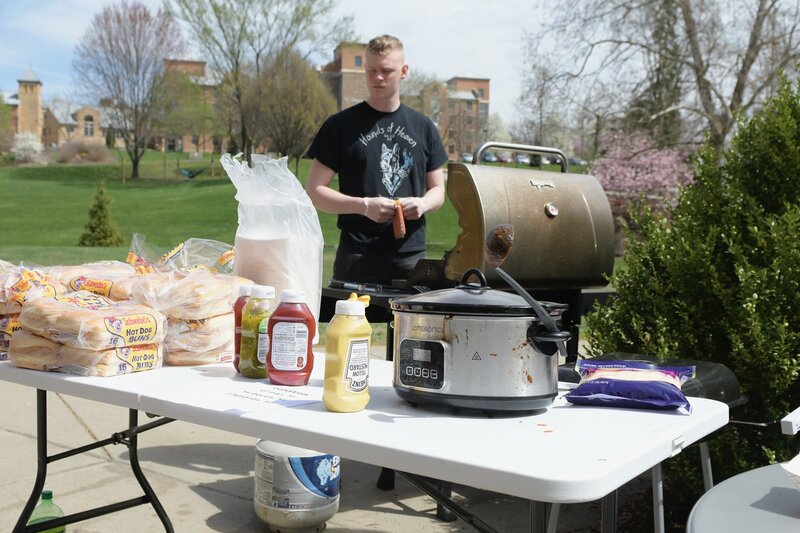 The food truck was new this year, organized by the Soldiers, and according to sophomore Christian Capello, it was worth it. “The daily special was amazing,” he said. Near the food truck, there was a bonfire around which students sat or stood and talked with each other. There was also a speaker playing music. “It reminds me of home,” freshman Brigid Kelly said. Overall, Flannel Fest was once again a huge success, bringing joy to those who attended. 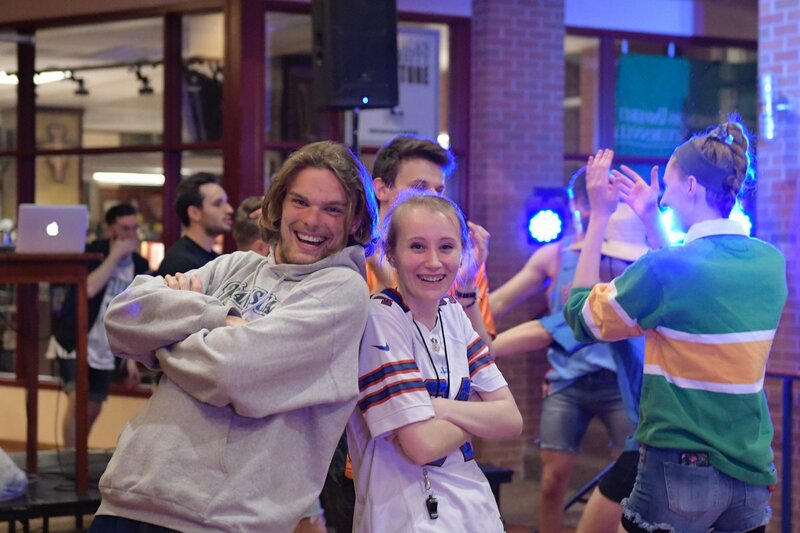 “It’s really fun, like a fall festival,” said freshman Kara Avery. “This is my first time here. I really enjoyed the food and the lovely atmosphere,” said senior Adrienne Alonso.